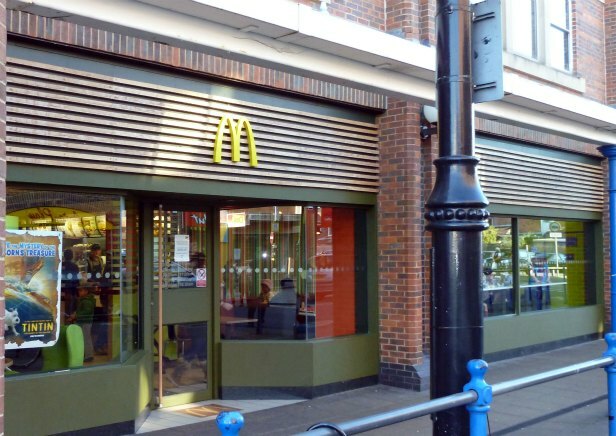 "That'll be a Big Mac and fries but hold the chair"
An Eastleigh Man has been placed under a curfew for three months after brandishing a chair in the Swan Centre McDonalds. Officers from Eastleigh Neighbourhoods Team had to be called to the late night incident on October 29 after Gareth Robinson, 31, became aggressive after an argument. Following an appearance at Southampton Magistrates Court last week, he was found guilty of using threatening or abusive words or behaviour with intent to cause fear of or provoke unlawful violence and sentenced to a 7 pm – 6 am curfew for every weekend until January. “I think the impact of this sentence will bring home how seriously we take public order offences. Being unable to go out and socialise at the weekends, and particularly over the Christmas and New Year period, should certainly make this man think twice about his actions in the future. The man will also have to pay £85 costs. The McDonalds restaurant has temporarily suspended its late night opening while its security arrangements are reviewed. The eatery will now close at 11pm instead of 3 am. It’s understood it plans to reintroduce extended late night opening soon.